The truth is is that's it's pretty gross to have to think about bed bugs ... but experiencing bed bugs firsthand is much worse than merely thinking about it! It's best not to take any chances when it comes to bed bugs. 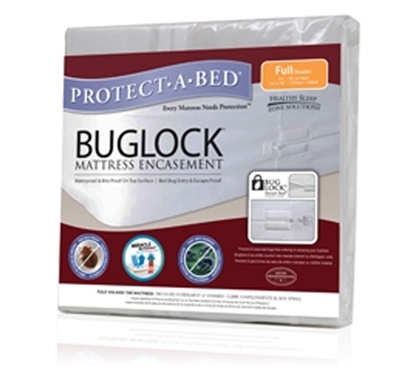 While there are chemical means of treating and preventing bed bugs, keep your dorm bedding protected from the start with this BugLock Twin XL Bed Bug Prevention Encasement. By zippering in your twin xl mattress, you'll be sure that bed bugs can neither get in, or if any have already snuck in, they won't gain access to your college bedding! Dust mites are also common yet equally unwanted critters. This mattress encasement for twin xl beds also acts as a dust mite barrier. Dust mites can contribute to asthma and other allergic conditions. Do you want them sharing your bed with you? We didn't think so. While this xl twin bedding encasement will keep out bed bugs and dust mites, it's air vapor porous. Even if you shower daily and follow good hygiene, if your dorm comes down with a bed bug issue, it may be too late to save your college bedding from unwanted guests! So keep that xl twin mattress wrapped up and stay on the safe side.